Rev. 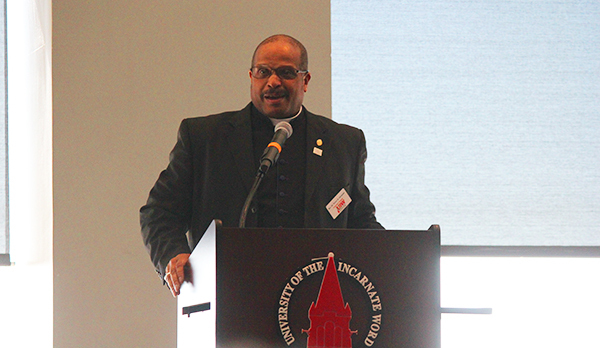 Dr. Trevor Alexander, Protestant chaplain, was the emcee for UIW's annual Black History Month Alumni Lunch held Wednesday, Feb. 1, in the McCombs Center Rosenberg Sky Room. The Black History Month Committee honored the late Adell Ferguson-Polk. Graduating in 1956 with a B.S. in Elementary Education, Adell was the first black graduate of Incarnate Word College. Polk's family, members of her community and the UIW community attended the event. Sunday Mass at 10:30 a.m. & 8 p.m.
Sacrament of Reconciliation - 11:30 a.m. Fridays or by appointment with Fr. Tom Dymowski, O.SS.T. at (210) 829-3131 or dymowski@uiwtx.edu. Acting UIW President Dr. Denise Doyle invites you to the third in a series of informal conversations with presidents of Catholic universities. They will share their insights and take questions from our community on the role of a president of a Catholic university. The next speaker is Father Dennis Holtschneider. Fr. Dennis has served as President of DePaul University since 2004. Located in Chicago, DePaul is the largest Catholic university in the United States. Fr. Dennis has a doctoral degree in Administration, Planning and Social Policy from Harvard University. The presentation will start at 4:30 p.m. Thursday, Feb. 9 in the Bennack Music Center. Light refreshments will be served after the talk. Please RSVP to rsvptopresidentsoffice@uiwtx.edu. Marquette University’s Dr. Susan K. Wood will present the 2017 Pierre Lecture entitled "Church Unity: Why Does it Matter?" at 7 p.m., Tuesday, Feb. 7, in the CHRISTUS Heritage Hall at the Village at Incarnate Word. Dr. Wood is an expert in ecumenical work with the Catholic church and numerous Protestant denominations and serves on the Joint Working Group with the World Council of Churches. Light refreshments will be served. For info, contact Dr. Julie Miller at (210) 283-5062 or miller@uiwtx.edu. The UIW Honors Program is hosting a unique educational experience called the Human Library. Human books are real people who are on loan to readers like you, ready to accept your questions about the topics they represent. You are welcome to come and engage in conversation with 15 human books from 4 – 7 p.m., Wednesday, Feb. 8, in the Mabee Library. For info, contact Jean Loden at (210) 832-3211 or jloden@uiwtx.edu. 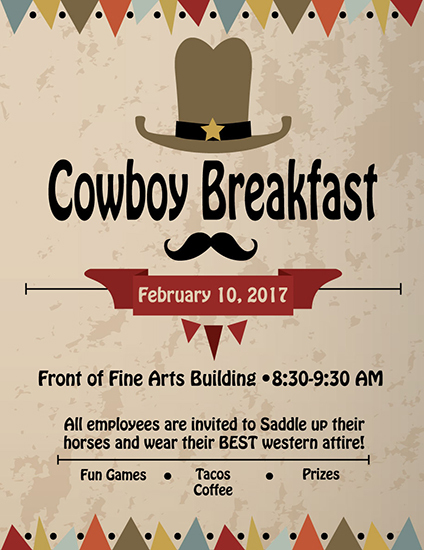 The Office of Human Resources is proud to host its annual Cowboy Breakfast from 8:30 - 9:30 a.m., Friday, Feb. 10, in front of the Kelso Art Center. Employees are invited for tacos, coffee, fun games and prizes. Wear your best western attire. For info, contact Heather Hamilton at (210) 829-6019 or hdhamilt@uiwtx.edu. 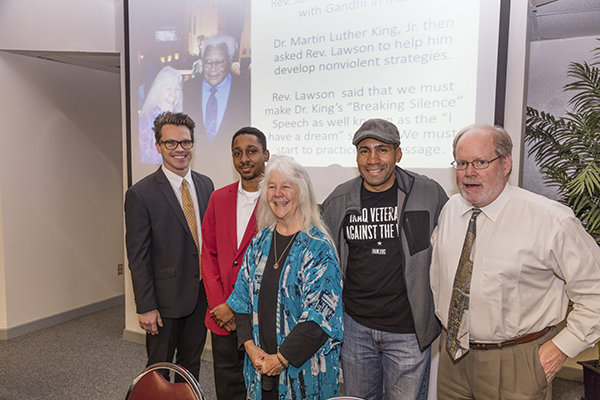 The Ettling Center for Civic Leadership hosted a special panel discussion Wednesday, Feb. 1, in the ICC Auditorium considering the relevance of Dr. Martin Luther King Jr.’s speech, Beyond Vietnam: A Time to Break Silence, for current times. Pictured above (left to right) are Dr. Trey Guinn, assistant professor of communication arts, Chris Barnes, UIW student, Sr. Martha Ann Kirk, CCVI, professor of religious studies, Jovanni Reyes, representative from Iraqi Veterans Against War, and Dr. Roger Barnes, professor and chair of sociology and criminal justice. The discussion will be held again at 12 p.m., Thursday, Feb. 9, in the Mabee Library Special Collections Room. For info, contact Sr. Martha Ann Kirk at (210) 883-5934 or kirk@uiwtx.edu. Feb. 15: Women’s Basketball vs. Texas A&M – Corpus Christi, 5:30 p.m.
Feb. 15: Men’s Basketball vs. Texas A&M – Corpus Christi, 7:30 p.m.
Feb. 10: Softball vs. Missouri State, 7 p.m.
Feb. 11: Softball vs. North Dakota, 1 p.m.
Feb. 11: Softball vs. Samford, 7 p.m.
Feb. 12: Softball vs. Arkansas – Pine Bluff, 11 a.m.
Feb. 4: Women’s Tennis vs. Trinity, 9 a.m.
Feb. 4: Women’s Tennis vs. St. Edwards, 1 p.m.
Feb. 10: Women’s Tennis vs. Colorado State, 4 p.m.
Feb. 11: Women’s Tennis vs. Pacific, 12 p.m.
Feb. 3: Synchronized Swimming vs. Stanford, 7 p.m.
For ticket info, contact (210) 805-3000 or visit this link. The Office of the Provost is accepting nominations for the 2017 Presidential Teaching Award. Nominations will be accepted through Tuesday, Feb. 28. This annual award acknowledges a full-time faculty member who exemplifies excellence in teaching leading to student engagement. Current students, alumni and colleagues are encouraged to submit the online form with rationale stating why the nominee is deserving of the award. Former recipients include Dr. Roger Barnes, William Gokelman, Dr. Neeta Singh, Dr. Bill Carleton, Theresa Tiggeman, Dr. Paul Lewis, Dr. Lydia Andrade, Dr. Jessica Kimmel, Dr. Doug Gilmour, Dr. Brian McBurnett, Dr. Scott Dittloff and Dr. Laura Munoz. For full details and nomination form, visit www.uiw.edu/teacher. 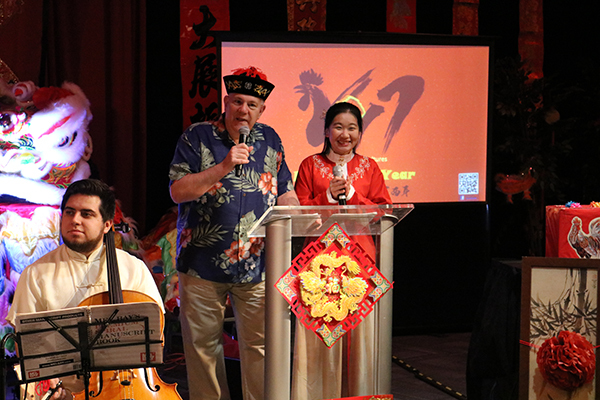 The Institute of World Cultures hosted its annual Asian New Year Celebration Tuesday, Jan. 31, in the McCombs Center Rosenberg Sky Room. Pictured above is emcee Dr. Paul Messina, associate professor of mathematics, with student volunteers at the cultural celebration. 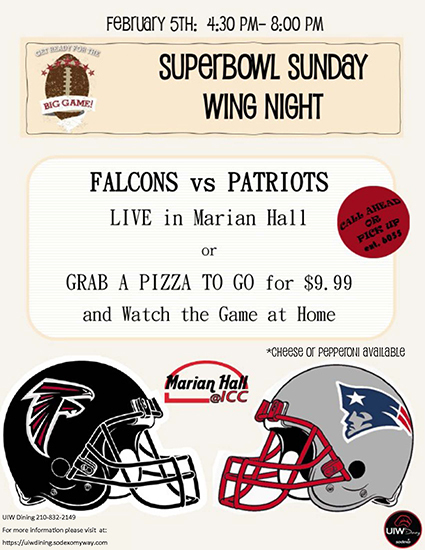 UIW Dining will be showing the Super Bowl Game live from 4:30 – 8 p.m., Sunday, Feb. 5, through half-time in Marian Hall @ ICC. Wings and pizza will be available for take-out for $9.99. For info, contact (210) 832-2149. The UIW community is invited to an Extended Academic Programs Info Session at 12 p.m., Thursday, Feb. 9, at the UIW Northwest Center (9729 Datapoint Dr., 78229), and at 6 p.m., Thursday, Feb. 9, at the ICC Conference Center. This presentation will provide an overview of the School of Professional Studies, School of Applied Sciences, degrees offerings and program benefits. Door prizes and light refreshments will be provided. RSVP at (210) 757-0202 or eapadmission@uiwtx.edu. Visit www.adulted.UIW.edu/rsvp to learn more. This Center for Teaching and Learning workshop will be in two sessions at 12 p.m. in the Admin. Bldg., Room 212 with lunch provided. The first session is Monday, Feb. 6, and the second session is Wednesday, Feb. 8. Participants will learn strategies for using concept maps in teaching and assessment as well as access templates for creating concept maps. Register here. For info, contact Kathy Allwein at (210) 283-6359 or kallwein@uiwtx.edu. In a joint project of Instructional Technology and the Center for Teaching and Learning, instructional designer Jessica Martinez-Palacios will have “office hours” to support the use of online teaching tools in face-to-face, blended, or online courses. This month will focus on setting up an electronic gradebook as well as an entire suite of communication tools offered by Blackboard. Instructional Technology is hosting a workshop on SoftChalk at 12 p.m., Friday, Feb. 10, in the Administration Building, Room 245. SoftChalk is a content-authoring software for educators. With SoftChalk, educators can create professional, engaging and learning content. Register here. For info, contact Terry Peak at (210) 218-8795 or tpeak@uiwtx.edu. Good Writing Is Good Writing - Or Is It? This Center for Teaching and Learning workshop will be in two sessions in the Admin. Bldg., Room 212. The first session is at 8 a.m., Tuesday, Feb. 7, with breakfast, and the second session is at 12 p.m., Friday, Feb. 10, with lunch. This workshop supports the QEP, so the first 10 faculty members to register for each session will receive a $100 stipend. Register here. For info, contact Kathy Allwein at (210) 283-6359 or kallwein@uiwtx.edu. This Center for Teaching and Learning workshop will be in two sessions at 12 p.m. in the Admin. Bldg., Room 212 with lunch provided. The first session is Monday, Feb. 13, and the second session is Wednesday, Feb. 15. Sway, a Microsoft product, is designed to present ideas simply and vividly on a screen rather than to an audience in a classroom or at a conference. Thinglink creates interactive images by linking other photos, web pages or audio recordings to a base image. Register here. For info, contact Kathy Allwein at (210) 283-6359 or kallwein@uiwtx.edu. The Office of Instructional Technology is hosting the workshop Technology Thursdays: Building and Editing Rubrics from 6 – 7 p.m., Thursday, Feb. 16, online via the Zoom interface. This session will show you how to create, edit and relate a rubric to course assignments, as well as apply the rubric in the Grade Center. Register here. For info, contact Terry Peak at (210) 218-8795 or tpeak@uiwtx.edu. The Office of Instructional Technology is hosting a workshop that will help you learn how to use Grade Center. This session will describe each type of column, help you determine which type you need and explain how to manage and edit them. The workshop is from 6 – 7 p.m., Thursday, March 2, online via the Zoom interface. Register here. For info, contact Terry Peak at (210) 218-8795 or tpeak@uiwtx.edu. The Office of Career Services & Professional Development will host a UIW Networking Mixer from 6 – 8:30 p.m., Thursday, March 2, in the McCombs Center Rosenberg Sky Room. This event is open to current students and alumni seeking full-time, part-time and paid internship opportunities. An etiquette dinner will take place the last half of the mixer. Registration is required for students. For info, contact (210) 829-3931 or careers@uiwtx.edu. The Employee Wellness Lunch & Learn is at 12 p.m., Wednesday, Feb. 15, in the Mabee Library Special Collections Room. Please RSVP at empwellness@uiwtx.edu. The topic and speaker are to be determined. In celebration of Catholic Schools Week, St. Anthony Catholic High School will hold their Community Service Day on Friday, Feb. 3. Students will be serving those in need in our community. Students will be serving the San Antonio Food Bank, SAMMinistries, Catholic Charities/Guadalupe Community Center and The Headwaters at Incarnate Word. For info, contact Rosi Cortez at (210) 601-5157 or rpcortez@uiwtx.edu. It’s a new year and the best time to take an opportunity to learn and grow in unexpected ways. Give your high school student the opportunity to learn and grow through a once-in-a-lifetime study abroad experience in Germany, France, and Austria through UIW Prep. All students are welcome to apply; scholarships are available for Brainpower Connection Students. The deadline for registration is Friday, Feb. 17. To get all the details on this exciting opportunity, visit us online at www.uiw.edu/prep/study-abroad. Visit St. Anthony Catholic High School at www.sachs.org. Visit Incarnate Word High School at www.incarnatewordhs.org. Visit UIW Prep at www.uiw.edu/prep. Visit St. Anthony Catholic School at http://www2.stanthonysa.org. Visit St. Peter Prince of Apostles Catholic School at http://www.stpeterprince.org. The Headwaters at Incarnate Word presents the documentary Love Thy Nature at 3:30 p.m., Monday, Feb. 6, at the CHRISTUS Heritage Hall at The Village at Incarnate Word. Narrated by Liam Neeson, the film points to how deeply we’ve lost touch with nature and takes us on a mesmerizing cinematic journey through the beauty and intimacy of our relationship with the natural world. For info, contact Pamela Ball at (210) 828-2224 or pamela.ball@amormeus.org. University employees receive free admission to the McNay Art Museum and the San Antonio Museum of Art with their valid UIW ID. Additional fees may apply to exhibitions. For info, contact (210) 829-6019. The University of the Incarnate Word provides reasonable accommodation with adequate notice. To request disability accommodation for events listed in this newsletter, visit www.uiw.edu/ada.